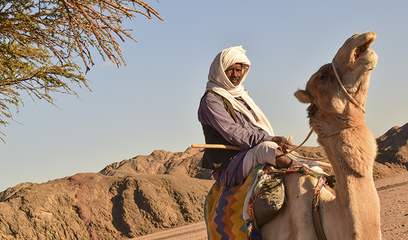 Marsa Alam's Ababda struggle against environmental stressors and tourist development that is driving their disenfranchisement, loss of traditional way of living and livelihoods. The Ababda are the indigenous people inhabiting the southern part of Egypt's Eastern Desert between the Nile and Red Sea. Throughout modern history, they have struggled against environmental stressors like encroaching desertification and drought. As well as socio-economic stressors due to state efforts for their assimilation and formalisation, and for the exploitation of their natural resources. These have been compounded by ongoing mining and extraction activities by state companies in the area. In 2003, a large part of Marsa Alam was declared a protected area. This, however, led to further land tenure insecurity and loss of access to their natural resources, such as some beaches for fishing and areas of their land. Numerous donor-funded "community development" projects are designed without any consultation or participation from the local community, and without addressing their actual needs. Furthermore, the objective of maximising the tourism attraction potential of the area has so far led to the monopoly of the tourist industry by state actors and stakeholders, and the disenfranchisement of the locals. Leaving the community to bear the brunt of the environmental impacts of its activities. The community founded the Abu Ghosoun Development Association to represent its needs and demands, and is also actively using all available channels to reach out to state officials. Project Details Tourist agencies advertise as follows: "A few years ago, Marsa Alam was still just a quiet fishing village of South Egypt, but since the construction of the International Airport in 2001, the place attracts more and more divers every year. They come here for pristine reefs and to avoid the crowded dive sites of Sharm El Sheikh and Hurghada in the north of the Red Sea." Italian DevelopmentCooperation Agency (AICS) from Italy - One of the major donors and project partners for the community development in Marsa Alam. Global Environment Facility (GEF) from United States of America - GEF is one of the key donors and project partners in Marsa Alam and Egypt's protected areas. Development of Alternatives The local community has expressed the need for a community-managed tourist project and some land tenure and management rights. Why? Explain briefly. Despite very little leverage, and a repressive atmosphere that stifles civil action, the local indigenous community is actively engaged in using all available communication channels with state officials and key actors to express their demands and achieve minimum security against impacts of ongoing development and a degree of participation. Life and Tradition of the Ababda Nomads, Jolanda E.M.F. Bold-Seldenthuis (The Netherlands). (Collaboration between the Ababda and archeologists, long list of references). 43 pages. Int. J. of Intangible Heritage, 2, 2007.